Attention domainers. The .travel registry wants your business. Tralliance has become the latest of the sponsored top-level domain registries to decide it needs to loosen the shackles of sponsorship and target a more general user base. Its sponsor, The Travel Partnership Corporation, has quietly changed the policies governing .travel in order to substantially liberalize the namespace. I say quietly, because the policy changes were published August 20 and there does not appear to have been any coverage yet beyond TTPC’s own site and this press release from a registrar today. The new policy document contains only two small changes, but they have big implications. Creators and providers of travel and tourism products, services and content. This seems to be general enough to exclude nobody, especially when one puts it in the context of the second big change that TTPC is proposing, which seems to allow domain parking. Currently, the registry policies state that all .travel domains need to resolve to active travel-related web sites or email addresses. That restriction is to be dumped entirely. No such incentives are included, but I’d guess that they may end up looking a little like the recent moves by .jobs and .co to engage in joint marketing deals with companies willing to promote the TLD. 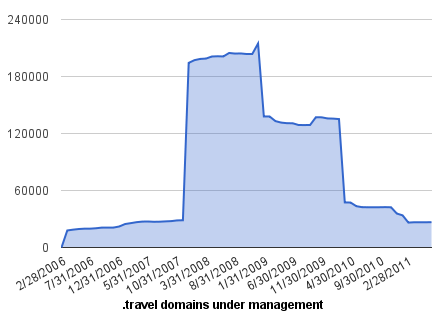 The upshot of all this is that it appears that .travel domains will soon be close to unrestricted. Registrants will still have to undergo a one-time authentication process, but that’s looking increasingly like a formality. The policy changes take effect September 20. It doesn’t look like they would disenfranchise anybody, except perhaps those who considered .travel an exclusive club, so I doubt there’ll be the same kind of outcry that .jobs recently saw. The .travel domain launched in October 2005. As of April 2010, it had 47,338 active registrations.